As we prepare to go back into the classroom, teachers think about everything from desk arrangements to revisions of instructional practices. 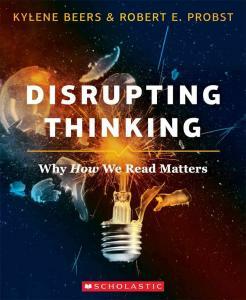 Blogs, friends, and my administrator suggested that the book Disrupting Thinking was THE book to read this summer. Each of those sources was spot on! This book asks teachers to completely rethink how we are teaching students to approach reading. Kylene Beers and Robert E. Probst have written other books about reading, Notice and Note and Reading Non-fiction, but Disrupting Thinking focuses on the idea that students start out eager to learn to read and over their time in school, they grow to dislike reading…A LOT! This book explores the way in which educators teach reading and how they can re-engage their students to develop deeper connections with what they read. The strategies that are in this book filled the pages and pages of notes that I took in each “part” of the book. Kylene Beers and Robert E. Probst are well known for their work with reading. Both come from a classroom background: Beers taught middle school and Probst taught high school. Beers has written mainly with a focus on strategies that strengthen readers, and Probst explores boosting engagement in reading in much of his writing. Combining these two thought leaders in one book creates a work of art that stretches the reader in ways that can forever change how students read. Kylene Beers has an educational resume that truly sets her apart as an expert in the subject of English. She has been the editor of the NCTE journal Voice in the Middle, president of the National Council Teachers of English, written numerous books on the subject of literacy, taught in a public high school and at Yale University, and she was a recipient of the Conference on English Leadership Outstanding Leader Award. Robert E. Probst’s experience parallels that of Beers. He has experience as a column editor for Voice in the Middle, served as a board member for NCTE Commission on Reading and NCTE Conference on English Education. He currently is Professor Emeritus of English Education at Georgia University. He was also the recipient of the Conference on English Leadership Outstanding Leader Award. This book can be summed up in three words: “Book, Head, and Heart.” It is those three words that will profoundly impact how students read. Beers and Probst approach this strategy by dividing the book into three parts. Part 1: The Readers We Want explores the ideal reader and showcases precisely the type of reader every teacher wishes they had in their classroom: responsive, responsible, and compassionate. These three characteristics lead to the creation of the leaders of tomorrow that we so desperately need and want. Part 2: The Framework We Use is truly the meat of the book. Beers and Probst reveal the strategy of Book, Head, and Heart (BHH). They do a fantastic job of breaking this strategy down through examples that not only show how to implement this reading (and writing) approach, but also the effectiveness of the strategy with students of varying ages. Part 3: The Changes We Must Embrace looks at current practices and focuses in education and asks the challenging question: Is that what is best for students? This part of the book visits where we are and explores where we need to go. Throughout the book, Beers and Probst dive into the struggle of getting students to connect with the material that they are reading. For a very long time, our students have focused on “the right answer” when responding to questions about literature. So much so that they have determined that their thoughts about the reading do not matter. A line from the book that truly shook my perspective on teaching literature was on page 29. It said, ”If the reader isn’t responsive, if she doesn’t let the text awaken emotion or inspire thoughts, then she can barely be said to be reading at all.” As educators, we have spent a great deal of time so focused on the text, that we have removed the reader, as a person, from the act of reading. We focus on decoding, Lexile levels, identifying context, the printed words, and less on impact, challenging preconceived notions, and processing messages. Time and time again, Beers and Probst refer to strategies that are common practice: having students answer prepared questions at the end of a reading or a list of ten questions at the end of the chapter that ensures a student has actually read the assigned material, and even the focus on writing detail-centered summaries of it. They take those strategies and turn them on their head. Beers and Probst lay out the strategy Book, Head, and Heart. This strategy sets students up to not only understand what they read but to also connect to what they read and become a changed person because of it. In the latter part of the book, many of the traditional best-practices are examined and challenged as to whether best-practices are stagnant or if we are willing to move to Next Practice or Disruptive Practices. Beers and Probst do an excellent job of identifying what all educators would want regarding readers in our classrooms. We want students to develop a connection to what they are reading and ideally become changed/inspired/motivated by what they have read. What surprised me was how simple the process was that they put forth. The questions that they ask throughout the book are simple yet profound. They do not settle for yesterday’s best practices. They challenge them and call on teachers to be willing to step out of their comfort zones and not only travel into unexplored territory but to take our colleagues with us. The method of developing a Book, Head, Heart method centers not on teaching kids how to process formulaically, but on guiding them through self-discovery and connecting deeply with the text. Educators are provided example after example of how to move students from focusing on the printed words to three big questions: What surprised me? What did the author think I already know? And What changed, challenged, or confirmed my thinking? These are the questions that focus on the first ‘H’ in BHH: Head. The presentation of their strategies highlights that we can change how students read, challenges traditional practices and confirms ideals about what good readers do when they read. After reading this book, I was left feeling frustrated about how I have taught reading for so many years but also energized by a growth mindset. Now is the time to make that change. Every conversation dictated in this book provides a real example of the conflicts teachers experience as well as the frustrations that students go through. I love how the discussions are written exactly as the child would have spoken it: no editing of the dialogue. It makes me feel like I am a fly on the wall during their conversations, learning alongside the authors. The way in which the content of this book is covered leaves me feeling like I could go into my classroom and make real changes that will inspire and drive students to see a higher purpose in reading. Though at times I was humbled by the fact that I have done some of the exact things that Beers and Probst highlight as issues within instructional practices, I left knowing that I could do something about it. I am not stuck in a system. I need to make changes where I have the authority to do so. Each chapter within the book is set up in a similar manner which helped me to know exactly what to expect. And the book is even designed to be an interactive book with online communities as a means to spark dialogue with colleagues. The end of each chapter features a section titled Turn and Talk. This section provided a great set of questions to think about and discuss with a peer. A frustration that I faced, due to reading a hard copy of the book, was that I wasn’t always able to go to the link that they provided to dialogue with someone because I didn’t have my computer with me as I was reading. Beers and Probst also included a video to go along with each chapter. I wish the picture at the end of each chapter had a QR code beneath. If this feature were added, it would allow me to scan it and go directly to the video. Though these are minor issues, I think that the overall experience would have been even more significant if these elements were more easily accessible. I found this book to be an easy read, but one that needed read in doses. The content at times is profound and requires the reader to chew on it for a while and process what is there. I would highly recommend reading the book with a peer. This collaboration would enable you to discuss the strategies covered in the book actively. You will want to make sure to have a highlighter or a pen to underline or annotate the text. This is a great book that will help guide you in creating more relevant practices that will move your students to become readers that can change the world. This book completely altered my philosophy on how reading is meant to be taught, and I know that I now have the knowledge to translate to action when it comes to creating opportunities for my students to not only connect with what they read but to be changed by what they read. 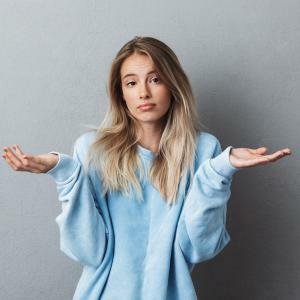 Back to School: Teaching Is Not What I Expected, Now What?